· 2.4GHz Wi-Fi remote control technology. · 4-channel drone, all directions (up/down, forward/back, left/right, side left/right, side left/right, 3D turn function). · Ready to fly; ideal for beginners, advanced and professionals. · Back home function, headless function, wifi, HD camera, suitable for flying VR, compatible with smartphone. · Quadcopter, S-idee 01622 Udi U842W wifi drone, HD camera, 4.5 channels, One-key turn home function, headless mode. Enjoy your surroundings from a totally new perspective. 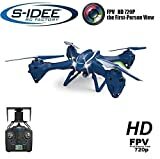 S-idee´s U842W quadcopter with WiFi in HD quality transmits 720p video signal directly to your smartphone. With the One Key Return function, the quadcopter returns automatically. Thanks to its compact shape and strong engines, the quadcopter is very maneuverable and can be flown up to force 4 winds in the open air. Technical data: 4.5-channel 2.4 GHz control. Built-in HD WiFi camera. One Key Return, return home function. Headless Function Video Resolution: 1280 x 720p/30 fps Photos: 2560 x 1440p. Power motors for indoor and outdoor flights. 7.4V 1000mAh Li-Po battery Battery alert system. Normal and expert flight mode. Setting on the remote control for very precise settings. Flight time of approximately 10 minutes. Range: over 200 meters. Charging time: approx. 90 min. Flight stabilisation system, 6-axis spinning system. Dimensions: 48 x 48 x 8 cm. WiFi video transfer live video on the phone. - Suitable from 14 years. Includes: S-idee Wifi U842W Quadcopter with HD Camera. 4.5-Channel 2.4GHz Control 7.4V 1000mAh LiPo Power Supply Battery USB charging cable for battery charging. 4 replacement thrusters. Screwdriver S-idee instructions in German. - No smartphone.